When I was in junior high school, I was assigned homework to find out more about my family’s heritage. This assignment was to include tracing my family tree, as well as discussing family traditions. I was excited about this, anticipating lost treasure, stories waiting for the right time to be told. I don't have to tell you that traditional Anglo-Saxon foods  —  cider and mutton  —  lack the allure of a Jewish grandmother’s beef brisket or homemade pasta from an Italian nonna. As for celebrations, which generation of our Anglo-Saxon family gave up feasting over the spoils? Or is that what we call Christmas? Isn’t there a long-lost relative somewhere who would like to make us chicken paprikash for dinner? Spanakopita for lunch? Krumkake for dessert? "To each other, we were as normal and nice as the smell of bread. We were just a family. In a family even exaggerations make perfect sense." To be fair, my family tree is not an easy one to trace. Early deaths and adopted names muddle the trail. Names such as Stewart and Smithers stand out, with a nod to Scotland and England, but there’s no one from the motherland to make bannocks or crumpets. The traditions of my family are squarely American, as is the food I grew up with. A melting pot, to be sure, not a fondue pot. This cultural envy, if it’s not already obvious, has almost everything to do with food. Which is why I’ve devoured the book Celebration Breads: Recipes, Tales and Traditions. Betsy Oppenneer’s book exposes a larger world of bread beyond the daily staples. Oppenneer is a well-respected baker with five bread books to her flour-dusted credit. In Celebration Breads Oppenneer explores the traditions that underlie breads of various countries and cultures. Her breads range from familar loaves, such as challah and stollen, to lesser-known concoctions, such as Navajo Blue Bread (made to celebrate a baby’s first laugh) and Bread of the Dead (bone-shaped loaves honoring the deceased on the Day of the Dead). There are cookbooks for cooking, and cookbooks for reading, and Celebration Breads is both. Oppenneer precedes each recipe with a story, sharing the history, religion and symbolism of the given bread, as well as the celebration tied to the making and eating of it. For every recognizable bread — matzo, Irish soda bread, blini — there are a handful of novel ones, which makes for interesting reading. But maybe not aloud; pääsiäisleipä, anyone? One of the things I appreciate about this book is how incredibly thorough Oppeneer is in writing recipes and describing the baking process. Each recipe includes options for making the bread by hand, mixer, food processor, and bread machine. I found answers to most of my questions either within the recipes or in the introductory chapters on ingredients, equipment, bread making, tips, and techniques. John Burgoyne, the talented Cook’s Illustrated artist, provided line-drawings for this book, which are especially welcome for showing techniques such as braiding or shaping dough, as well as what the breads should look like when finished. As a novice bread baker, I appreciate Oppenneer's clarity in the “Four Basic Rules of Bread Baking” (how to activate yeast, knead dough, add flour, and test for doneness). Oppenneer advocates using an instant-read thermometer to tell when bread is done, and I have to say it worked better than thumping the bottom of the loaf. (Hello, anyone home?) It's an especially useful tool when changing the size of the pan or shape of the dough, negating guesswork and miscalculation. 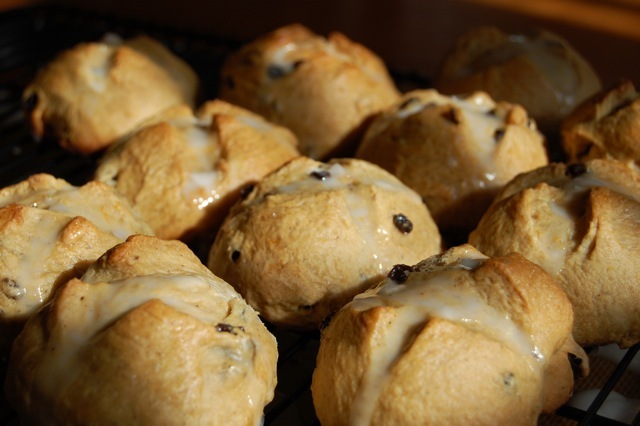 In Celebration Breads, Oppenneer says that hot cross buns “most likely originated with pagan celebrations honoring the goddess Eastore.” Though the church tried to put the kibosh on these little cakes, the demand was too great. Thereby the church decided to bless them, and the cross that marks the top of each bun was added to symbolize the cross. “Some say the cross on top of the bun represents the four quarters of the moon or Christ’s cross; others say the bun is slashed to let the devil fly out," writes Oppenneer. In lieu of finding Anglo-Saxon recipes — admittedly, I haven't looked too hard — I’ve come to appreciate adopted food traditions, however vague their ties are to my heritage. 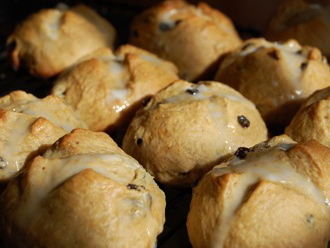 Hot cross buns, which for years I've bought at a local bakery, are now part of my own family's Easter-morning ritual. The difference this year is that I’ve made the buns myself. Perhaps it's the start of a new tradition. Also on Culinate: a column on reusing old bread and the cookbooks Beard on Bread and The Bread Baker's Apprentice.